A fragile peace. A decade ago, the United Worlds and Vorn were at war. Just as we never knew why they attacked, we never knew why they withdrew from U.W. space, but given the losses suffered, we were glad they did. 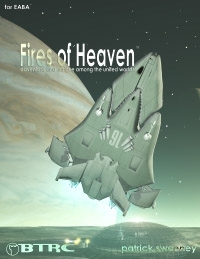 Fires of Heaven is a massive 426 page gameworld for EABA, with details on every aspect of the United Worlds, alien races, starship design and combat, psionics and more.